Last week, we discussed the impact of poor ad placement on the consumer experience. We addressed advertisers’ ability to create three categories of frustrated internet users: Left-out Larrys, Annoyed Annas, and Mistargeted Mikes. Let’s dive into what this internet experience looks like from their perspectives. These individuals find it frustrating when advertisers disregard their current intentions online and they get blasted with irrelevant advertisements. These hap-hazardously placed ads fail to speak to their audience like real humans - and I’m not talking about ad copy. Many advertisers don’t understand that we need to listen for the right social cues to know when it’s the right time and place to promote our stuff online. When we instead think of consumers as merely eyeballs to get our ads in front of, when we pay no mind to a consumer’s current intentions on the internet, we alienate them - and we turn them in the direction of our competitors. At best, consumers simply ignore poorly placed ads - that’s why only 0.05% of display ads get clicked on. Other times, they remove ads from their browsers entirely by installing ad blockers. And according to a Statista report, 30.1% of devices will use ad blocking technology in 2018. But when consumers are really mad, they take to social media to rant about their bad experience with your brand - and that’s no good. These people are not happy with the way ads are delivered today. This is because ad tech still has room for improvement. But before we touch on the technology aiding good ad placement, let’s walk through a day in the life of our three categories of annoyed consumers. Let’s say I’m Left-out Larry. I’m looking on the internet for the best type of TV for me. 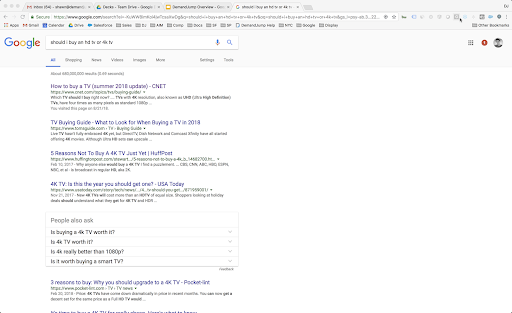 So I search, “should I buy an HD TV or a 4K TV?” I don’t know much about TVs so I want a company to help me find the right one. Looking at this screenshot, not a single advertiser has identified my search query as an opportunity to reach me at this time. No company has served me an ad that could bring me a step closer to buying their TV. Imagine if you had the perfect TV for Larry. If you could speak to him right then and there, you’d have helped Larry out. He’d be that much more likely to consider your TV when it comes time to buy. Let’s talk about Annoyed Anna. Good advertisers deserve credit where it’s due. Retargeting is effective when done right. These types of ads are 76% more likely to be clicked on than regular display ads. But even retargeted ads can leave consumers more annoyed than interested. According to Invesp, 38% of internet users are put off by retargeting ads. This is because most advertisers fail to consider the context of their ads when delivered to interested consumers. So why is Anna annoyed? Anna is currently looking at a fashion blog about fashion blogs. Yeah, you read that right. She is deep in the weeds of fashion research right now. So, her intentions are not even close to thinking about that marketing software she checked out last week. How likely is it that she will click on a software ad on this page? Not very. What if advertisers retargeted Anna when she was in software consideration mode? They could increase their return on ad spend by 242%. But because advertisers failed to consider where Anna is on her internet journey, we’ve annoyed her by shouting something irrelevant when she was reading about fashion. And now she doesn’t want to see us again. This is because we’re not advertising to her like a human. We’re seeking impressions, not a conversation - and she’s onto us. Want to learn how REI drives traffic? Download our eBook now. As I mentioned last week, our hypothetical “Mistargeted Mike” is doing research for a fishing trip with his dad. But because the cookies tracking him inaccurately suggest he’s interested in women’s fashion, he’s getting ads for female apparel. One, Mike’s not a woman, nor is he interested in lady clothing. This means the company advertising to him (and likely countless other mistargeted individuals) is spending a big chunk of their budget making impressions on someone who will never convert. They’re wasting money and they’re annoying a guy, turning him into an advocate for any company but this one. Had this company gathered the right data and relevant insights, they could understand that Mike doesn’t want to speak with them. Second, they could avoid wasting money on Mike by focusing on where their ads are placed, instead of just who they’re placed in front of. 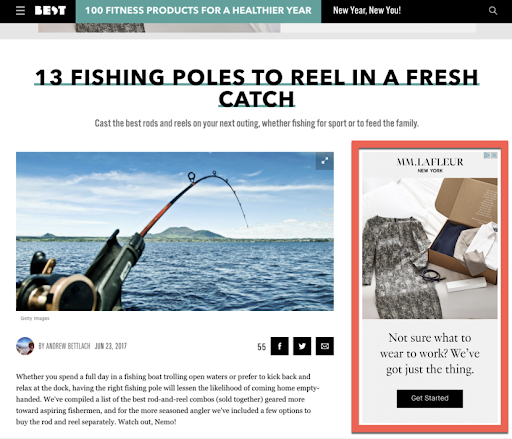 When someone visits this fishing article, they’re in a fishing mindset, and they are much more likely to click on an ad related to what they’re researching. 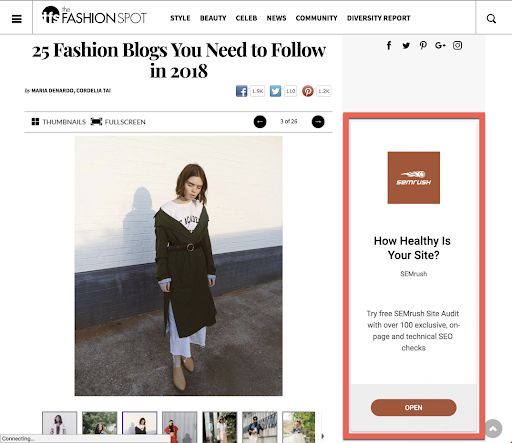 So, without even using cookie data, this company could have found an appropriate audience by targeting relevant websites or advertising within the search queries used to find products like theirs. The better advertisement for this website would have been an ad for an online bait shop - not women's clothing. But most marketers don’t use the right tools. It takes a lot of sophisticated data analysis to make sense of internet behavior and align marketing efforts with the current intentions of internet travelers. Understanding google search patterns is a difficult beast to wrangle. There are 40,000 searches made every second, that’s 3.5 billion every day - and 20% of these search queries have never been asked before. Very few companies have the ability to see search behavior with much clarity. The data is so vast, it can be almost impossible to gain meaningful insights from all the ever-updating search data. If marketers knew where to gather such insights, they could better inform their content copy and paid search efforts to align with the conversation (google searches) being made on the internet. They could then show up when people are actually searching for information relevant to their offerings. There would be far fewer Left-out Larrys. Dynamic journey targeting is key. Targeting along the dynamic customer journey, aligning ad placement with pertinent google searches and relevant websites (which DemandJump offers), allows advertisers to speak to internet users like real people do. Real people listen for the right social cues to know when it’s appropriate to promote something, instead of shouting in front of anyone who will listen. The same rules apply to digital advertisements. People want relevant and timely ads. But most advertisers just don’t have the tools to do this well. If this kind of targeting is of interest to you, reach out to DemandJump. Let’s chat about how the Traffic Cloud® can help you speak to consumers like they want to be spoken to.